As the New Year is coming, almost everyone are haunted by the problem as to how to pick a suitable gift for his best friend as gift. This problem also dogs Allen. With New Year coming closer, Allen becomes more and more anxious. This afternoon, a good idea occurs to him that he could pick a FOSJOAS two-wheel electric self-balancing scooter as a gift for Jerry. Friends around Jerry all have electric self-balancing scooters. They usually steers them around Jerry. He thinks Jerry is bent on it very much. If he gives Jerry a FOSJOAS intelligent self-balancing scooter for New Year gift, Jerry surely goes into rapture. Allen also believes that Jerry will lose his heart to FOSJOAS intelligent self-balancing scooter. 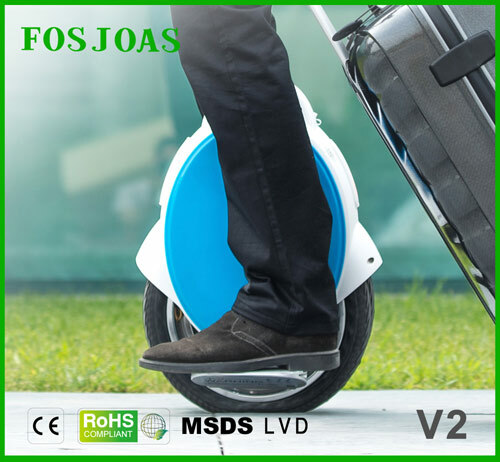 However, there are FOSJOAS models of one or another sort, the single-wheeled intelligent scooter V6, the twin-wheeled self-balancing scooter V2 and two-wheeled intelligent scooter K3 and U3. Which is the best model for Jerry. Although Jerry badly wants to own a set of electric self-balancing scooter, he has never ridden it. Therefore he is not necessarily able to steer the electric unicycle smoothly. Given that fact, Allen drops FOSJOAS V6 for it will take Jerry much time to learn and practice. It requires so much patience that Jerry might baulk at it. Then Allen considers FOSJOAS two-wheeled intelligent scooter V9 and U3. They are easy to ride and are state of the art. But the price is a bit hardly and out of Allen's range. For the moment, he cannot afford it. So he has to give up this idea. In the end, the store owner recommends FOSJOAS twin wheel electric scooters V2 to Allen. The owner seems to read his mind and introduces the latest model by FOSJOAS to Allen. Allen find it within its range and easy to ride for Jerry. It merely takes some minutes to learn it. Jerry has the patience to practice it.